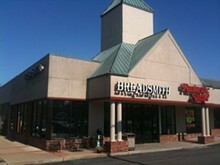 Breadsmith is a bakery located in Warson Woods. Every day brings a new loaf (raisin cinnamon, honey oat, honey whole wheat, rosemary garlic ciabatta, Asiago cheese, gluten-free, Greek olive, and more and more).Every day brings a new loaf (raisin cinnamon, honey oat, honey whole wheat, rosemary garlic ciabatta, Asiago cheese, gluten-free, Greek olive, and more and more). Every day features the wildly popular apple pie bread, a lip-smacking, calorie-loaded concoction whose every ounce lives up to its sinful-sounding promise. And, every day — all day — Breadsmith only makes bread.